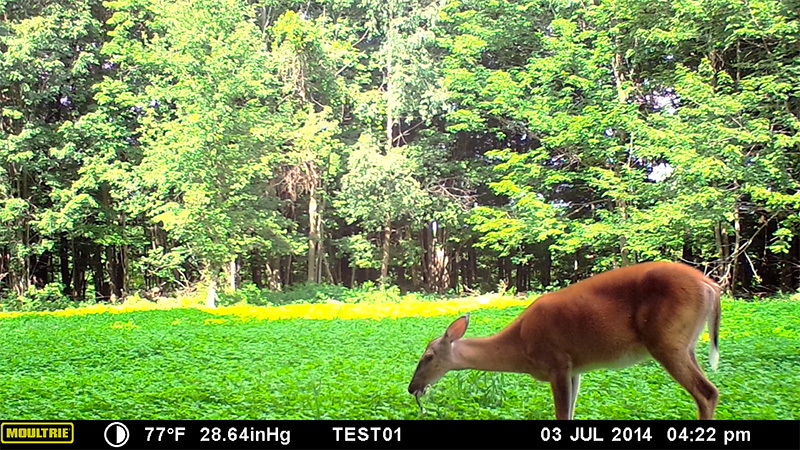 While I’m not a huge technology junky (when it comes to hunting) I am absolutely crazy about trail cameras. 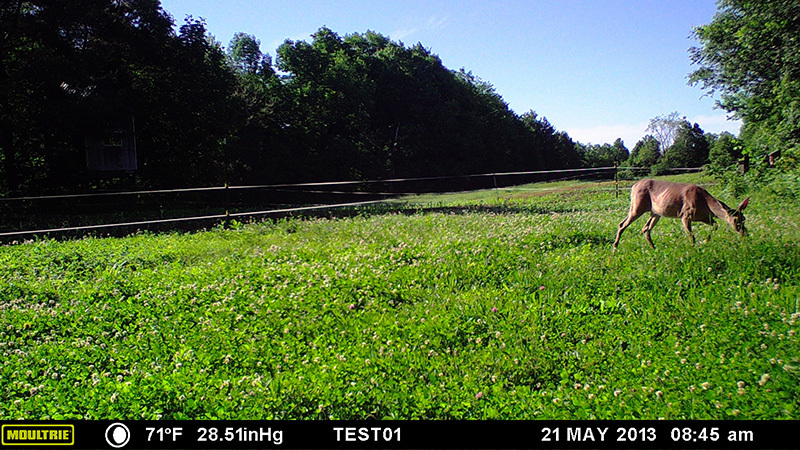 Trail cams allow me to not only identify the deer using my property, but I can also observe predation, food plot utilization, fawn recruitment and even trespassers. But in order to do these things you have to first trust your trail camera. For that reason, we like to understand their features and put them to the test. 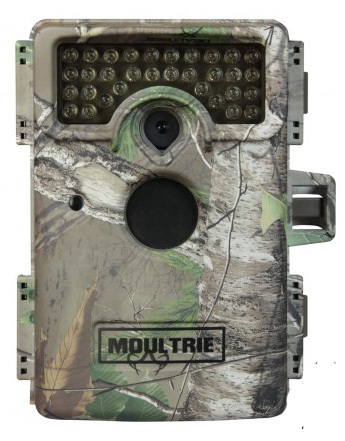 This year’s model is the Moultrie 1100i, their flagship trail camera for 2014. Now for the purpose of full disclosure, Moultrie is a sponsor of this website. We were using Moultrie cams long before they were a sponsor and since they were my personal favorite, we sought them out as a sponsor. As my visitors have come to expect – we provide objective reviews regardless of sponsorship. That is not only expected by our visitors, it is expected by Moultrie. They have always appreciated all honest and constructive reviews – just as any good company does. The 1100i features 80’ No-Glow Infrared LEDs. We did not specifically measure the distance but we got at least that, more like 90’ before the subject was basically indistinguishable. We also tested the No-Glow with several night shots of deer at very close range. We posted this on Bowhunting.TV where an adult doe fed 5’ from the camera for several minutes without noticing the 1100i. This scenario was witnessed dozens of times on several night shots. The only photo I have of a deer looking at the 1100i was the first night after I hung the camera and removed the brush. We primarily used the Medium setting. The enhanced setting is only chosen on occasions when we need near print-quality shots. The higher resolution settings uses significantly more card capacity – but more importantly, when we are checking 30 trail cams we need to load those chips quickly into a portable viewer and the lower resolution dramatically speeds up that process. Video Resolution - There are two Video Resolution options as well. For our test we used the Full HD option only. This is a new, higher resolution that we were anxious to test. The previous models supported 720 HD in the past. Trigger Speed – the unit advertises a .5 second trigger speed which is greatly improved over previous models. Storage/Memory - Works with SD/SDHC Class 4 cards or higher, and can handle up to 32 GB. Memory cards are sold separately. A new feature allows cards that reach capacity to be overwrite older files (optional). Power/Batteries - The unit requires (8) AA batteries (Alkaline, NiMH rechargeable, or Lithium batteries) with Lithium being the most preferable for cold weather and extended run times. Other Features – The 1100i comes in the same size package as the previous mini-cam models, it is lightweight and four of them will fit into the average deer hunters daypack. The unit is compatible with Eye-Fi Connect X2/Pro X2, which allows the camera to transmit images to a Wi-Fi network and the internet. Finally, the 1100i mounts with a 1” wide by 4’ long mounting strap and a greatly improved cinching buckle. Alternatively, you can mount the 1100i to any bracket which has a 1/4-20 standard tripod mount screw. The 1100i comes in four modes of operation. Motion Detect-Photo, Motion Detect-Video, Time-lapse, and Time-lapse+Motion. Motion Detect Photo mode – this is the standard use for most trail cams and the differentiator between the 1100i and previous models is the expanded size or 12MP enhanced. This shoots a photo at 4608x2592 which provides superior quality for even print applications. The mode I use is the medium setting at 3MP and find that more than sufficent for my uses. Motion Detect Video Mode – The improvement on this camera is the upgrade to a Full HD specification of 1920x1080. This provides very detailed video and ultra-smooth motion. It operates at 30fps in 16:9 frame ratio. Time-Lapse Mode – sometimes referred to as “plot mode” this allows you to choose your time intervals in either one or two time blocks. This was a surprising and welcome feature. I was able to set a morning and afternoon block. The morning block was 3 hrs and the evening block was the last 1 hour of the day. The unit no longer relies on sensors to detect sunrise and sunset, you now have total control over those settings. Time-Lapse + Motion – Another welcomed feature. This allows you to set the camera to take time lapse photos as described above, but it will also trigger on motion when detected. So you can have the best of both worlds. The motion settings you specify will determine whether to shoot a photo or video when motion is detected in Time-Lapse + Motion mode. We first received the unit in May, 2014 and used it through the first week of September. We started our tests with the Motion Detect-Video mode. We then moved to the Motion Detect-Photo mode. We spent two weeks on Time-lapse + Motion Mode, and finished off with a few days back home on video. During that time we shot 800 photos and 45 minutes of videos - on a single set of batteries I might add. Trigger Speed - We did not do extensive trigger speed tests and can’t substantiate whether the unit achieved the advertised .5 second trigger speed. All we wanted to know is how many animals were missed walking in front of the cam? We had over 800 photos and only 3 were likely misses (I say likely because I can’t see anything in front of the camera). The trigger speed is greatly improved over previous models and this was confirmed by several photos of deer running through the frame. Video Quality – I only tested the Full HD mode and was impressed with the results. The motion was superb (watch our video above) and the detail was excellent. The only issue I had was that during certain lighting conditions the sensor would blow out the color saturation. I was unable to figure out just what conditions caused this, but it was not prevalent. I would estimate about 5% of the shots exhibited this saturated condition. In all cases, you can clearly make out the animal so it’s not too critical unless you had plans for the HD footage on a TV show or video project. Photo Quality – We only tested one photo in 12mp enhanced mode but found the medium resolution to be perfectly acceptable in all photos. Judge for yourself above. NoGlow LEDs – I only had one photo of a deer looking at the cam and that was on the very first day the camera was set up. Other than that, we had no visible clues of deer being alerted to the camera via the LEDs. We experienced a little better than the advertised range of 80 feet. I could see deer clearly at 90+ but beyond that was pushing the limits of the LEDs. We achieved far better illumination distance with this cam than the No-Glow cams that utilize the black plastic LED shield. Battery Life – I normally use Lithium batteries in my most important Trail Cams. For this test I wanted to use NiMH rechargeable batteries that I bought new and used once after a full recharge. By the time I completed our tests I had 35% battery life remaining on this first set. This was after 45minutes of HD video and nearly 800 photos. Battery life appears to be very acceptable in this camera and you can expect far better results with Lithium batteries. Menus, Viewer, and Settings – It took me a little while to get used to the menu flow for changing settings. But this was mastered by the 2nd visit to the camera. I don’t think it’s as intuitive as the older M100 Mini-cam menus but once mastered I ended up preferring them on the 1100i. The view finder is much larger for aging eyes and allows you to navigate the menus easier than the older on-camera viewer. 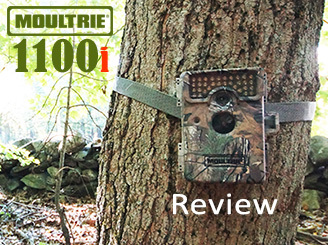 The New Moultrie 1100i is the flagship product of Moultrie’s 2014 camera line and we can see why. It performed well on all of our real-world tests with almost no misses and excellent quality video and photos. We experienced some minor color saturation issues with the right combination of lighting but that was experienced in less than 5% of our videos. The photo quality is excellent, and the full HD video is outstanding – especially if you are looking for high detail and smooth motion. We were very impressed with the innovative customization found in the Time-Lapse mode and were blown away with the new Time-Lapse+Motion feature. Battery life was very acceptable – especially considering we tested this camera with NiMH rechargeable batteries instead of Lithium batteries. With an MSRP of $229.95 this is well within most hunters’ budgets for a high quality trail camera. We will be using several of these cams this season so look for more photo and video examples in the coming months.